A joint WARTZ and PISSOF force was routed this week after it sustained heavy casualties attacking a column of ARSe and PANTZ troops defending the the town of Matola, one of the major strategic keys to the /Setumsian Highlands and an important Petramco base. The defeat leaves the troops of the newly formed Ztumsia/Setumsia alliance in control of the key economic areas of both Ztumsia and Setumsia and is a major blow to Petramco's hopes of maintaining a presence in the area. WARTZ troops are reported as being dispirited and have retreated to their home base. 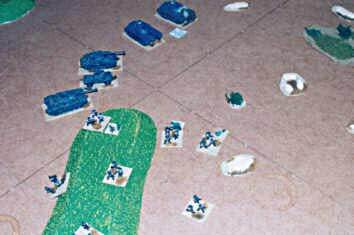 It was a very bad day for WARTZ and PISSOF as over half of their units were routed or destroyed. A heavily outnumbered force of ARSe and PANTZ tanks caused considerable damage to the PISSOF and WARTZ armour, destroying or routing one unit of armoured cars and one of tanks. Two units of WARTZ infantry attacked across a plain but were routed by fire from PANTZ Heavy Support Unit 17, deployed on a hill, while an elite unit of ARSe infantry routed attacking PISSOF infantry with fire from APCs and an Antiaircraft technical. An elite unit of Ztumsian SAPS arrived late in the day and helped complete the rout. Setumsian and Ztumsian troops suffered minimal losses. WARTZ and PISSOF tanks engage in a long range duel with enemy tanks while WARTZ marines advance across a hill. The marines routed under a barrage from the mortars of PANTZ Support Unit 18 while the armour failed to make any headway against well handled tanks from ARSe and PANTZ. We received the following from one of our correspondents living in the WARTZ. It is reprinted verbatim and without comment. "The western media does not pay much attention to what goes on here in the WARTZ, tucked away as we are in a highly unfashionable corner of Africa. This is a pity because what we have is a good news story which would cheer the hears of liberals everywhere - a story of stable democracy, economic growth and a real partnership between black and white and between big foreign companies and the locals. "All you have to do is look at the statistics. Since we discovered our offshore oil we have gone from being one of the poorest parts of Africa to one of the richest. We never used to have running water or electricity but now we have fancy cars and big houses with swimming pools in the basement. Well some of us, anyway. A string of multiparty elections have been conducted over the past ten years, all without a hint of trouble. That's what can be achieved when you only allow whites to vote for the President. "For all this we must thank our friends from America and the UK, most particularly Petramco who have poured billions of pounds into making us an oil power. They are just so incredibly thoughtful! They have helped President Anderson buy a private jet and refunded him millions of dollars in way of apology for a contract, signed by his predecessor, giving them all of our oil. It can only be a matter of time before the common folk see some of this money. They gave us our constitution, assuring us that forming a "Consultative Assembly" of tame blacks would look good to the long haired beard and sandals human rights activists that come poking around from time to time. "We have great faith in President Anderson. In fact we've voted for him three times by margins greater than 95%. Last time we were son enthusiastic that, in some areas of the country, more than 100% of us turned out to vote. But then our president comes from fine stock. So talented are his family and friends that they control most of the country. The Government's oil business is run by one of his brothers, while another is in charge of chopping down our forests. The Army is run by his cousin, as is the security service, while all our generals were at Sandhurst together, come from the same town and went to the same school. "Of course even here in paradise their are some malcontents, usually blacks complaining that we whites are ripping them off, stealing their land and resources. They are encouraged to take up residence in neighbouring countries and those that don't are easily handled by our brave security services. "Our real fear now is of the hand of history. For at 60 President Anderson is a good twenty years older than most of us when we die. And while we do have political parties and a constitution most of us understand that succession is a family matter. We worry about his only son, recently returned after working for Petramco in the USA. He has denied the awful rumour, circulated a few weeks ago, that he had been arrested for an offense involving a large amount of cocaine. His hurried trip home, involving a midnight walk over the Mexican border, was undertaken because he felt the need to console his mother after the death of her favourite corgi. What a lovely boy.